Clear and quiet this early Tuesday on California’s north coast — no heavy-duty ground movement either in the wake of a cluster-swarm earthquakes on Sunday. And we “…dodged the bullet…” again — although the 6.8 (downgraded from a .9) shaker was even bigger than the 2010 6.5, the effects were way different. Sunday’s tumbler was 50 miles off shore and 10 miles below the seabed, so by the time the shock reached us, the roar was much more easier to swallow. The one three years ago was about 30 miles away. Shaking and moisture: The earthquake trumped news that Sunday’s rainfall broke a 30-plus year record. Scott Carroll, a meteorologist with the National Weather Service, said Eureka recorded 2.58 inches of rain Sunday, smashing March 9’s previous record of 1.17 inches in 1983. 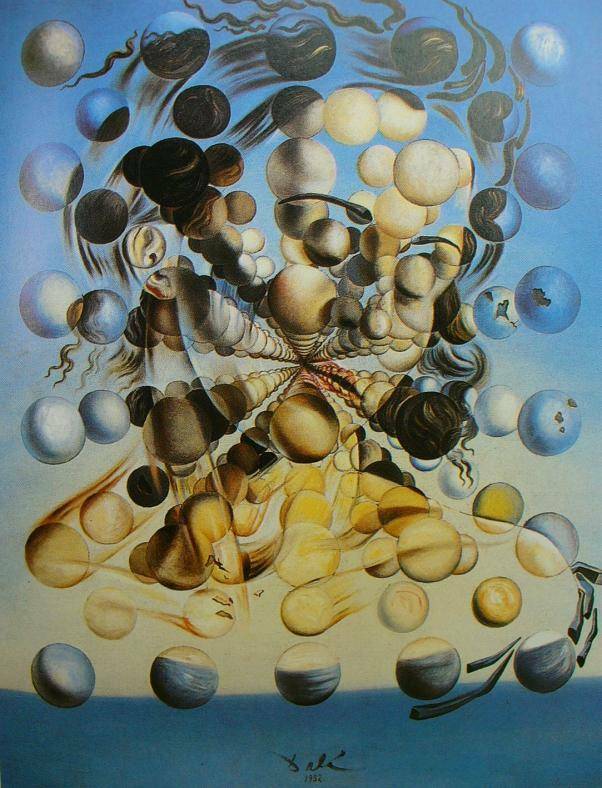 (Illustration: Salvador Dalí’s ‘Galatea of the Spheres,’ found here). Yeah, we’re one of the few places in the state where the drought hasn’t crushed us — last week, the county’s largest water reservoir, Ruth Lake, was pronounced as full, only the third time in 52 years this has occurred so early in the year. Scientists estimate it will be at least four decades before the reactors are rendered safe, decontamination work is completed and the tens of thousands of people who used to live in the exclusion zone around the plant can return. Some believe that time-frame is optimistic. Reportedly, us here on the US West Coast can expected the radiated water from Fukushima to reach us next month. If so, the pop-culture appearance is the latest public relations gamble that Mr. Obama and his aides have taken in their pursuit of new ways to deliver their message to the connected-but-distracted generation. “Between Two Ferns,” which satirizes the low-budget look of public access television, much as “Wayne’s World” did, has had episodes that have been viewed as many as 30 million times, often because of their outrageous content. “We have to find ways to break through,” said Dan Pfeiffer, the president’s senior adviser and chief communications strategist. Crack it, roll with it.